Starting from the top left corner, clockwise (sorry for the slight redness of the colours): ugly milkcaps/Lactarius turpis/tõmmuriisikad (photo) ; various ceps/porcini/puravikud; Lactarius scrobiculatus/võiseened; the slightly greenish ones are saffron milk-caps/Lactarius deliciosus/kuuseriisikad - very delicious mushrooms that can be thrown straight onto your frying pan (photo); rufous milkcaps/Lactarius rufus/männiriisikad that must be blanched once or twice to rid them of their bitterness; wonderful (though rather unexpected this time of the year) chantarelles/Cantharellus cibarius/kukeseened; as well as three handsome Pied Bleu or Wood Blewits/Lepista nuda/lilla ebaheinik that I preserved in brine. 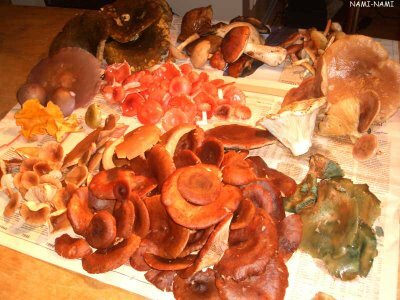 And finally some light pink russulas/pilvikud (in the middle, next to that lonesome green russula on the left) that must be cooked in water before they can be fried or sauteed. 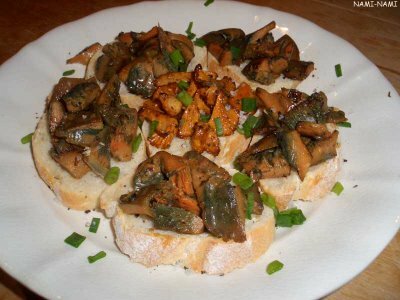 The yellow chantarelles and saffron milkcaps were each fried in butter and then used as a topping for simple bruschette. The russula mushrooms were blanched twice and were used for mushroom sauce late last night (fry with some onions, top with cream, serve with mashed potatoes). The ugly milkcaps and Lactarius scrobiculatus mushrooms were first boiled twice, and then preserved in salty brine (after soaking, these can be used for sauces, quiche filling, salads), rufuous milkcaps were pickled in marinade (can be eaten as a snack or used for salads). Again, I'm rather pleased with my bounty, and am looking forward to using all those mushrooms during the coming autumn and winter. 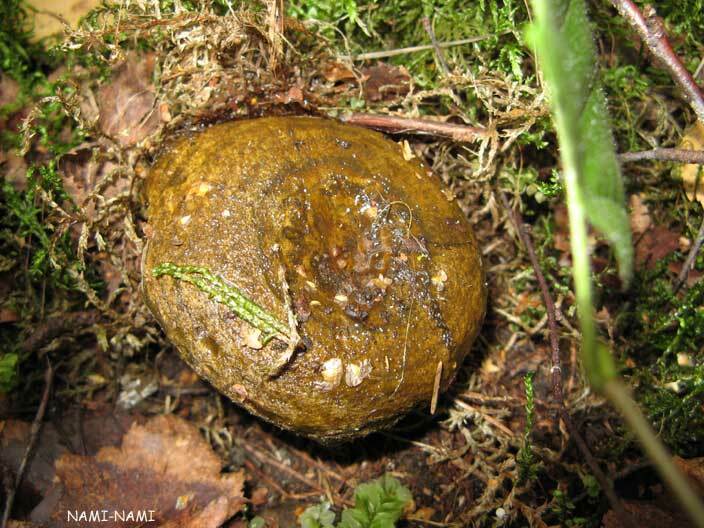 Do you ever find mushrooms you can't identify and leave behind? These are gorgeous, so many and so many kinds! I'm so jealous of your findings! Alanna - yes, I do. 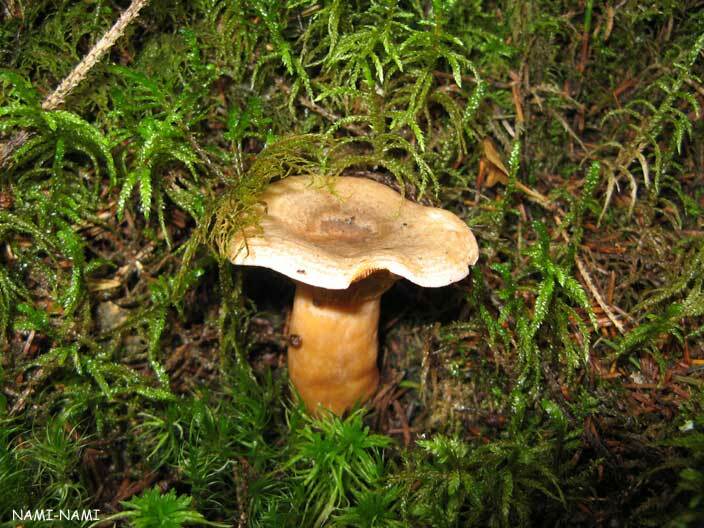 There are three reasons NOT to pick certain mushrooms. 1) we cannot identify them, so don't know if they're edible or not; 2) we can identify them as non-edible and/or poisonous; 3) usually edible mushrooms, but either gone bad because of mushrooms worms (I'm sure there's a proper name for them:) or age.